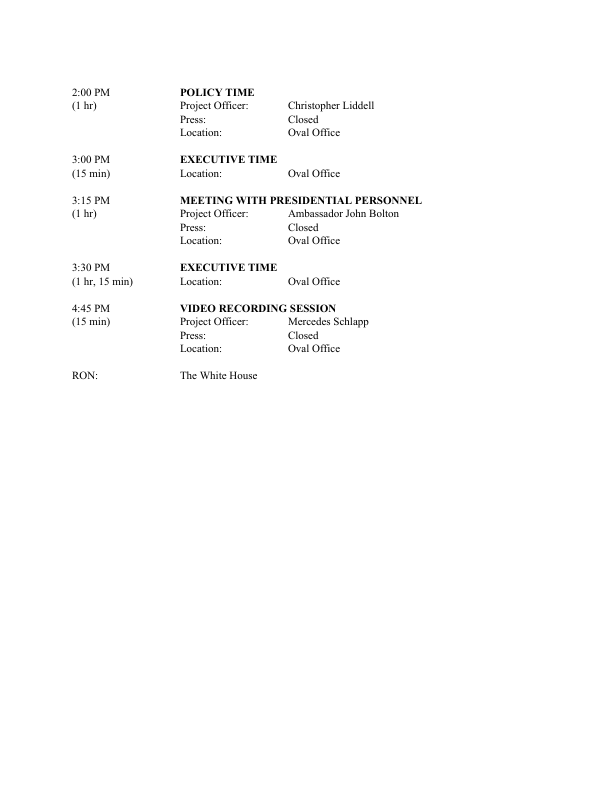 Axios published both the spreadsheet they made from the data leaked, and PDF corresponding to the schedules retyped in the format White House staff received them. I tried finding out how they went from the latter to the former, but this was apparently not reported. Quite a niche topic, I agree. Here’s the untidy PDF below. Seeing the PDF format above reminded me of the cool new pdftools feature Jeroen Ooms announced back in December: low level text extraction. While the pdftools::pdf_text() function returns “a character vector of length equal to the number of pages in the file”, pdftools::pdf_data returns a list of as many data.frame’s as there are pages, each one indicating the coordinates and width of each text piece. So powerful! Trump’s schedule appeared to be a perfect use case for this functionality! It seemed to work but then re-installing pdftools failed. Jeroen thankfully advised me to remove my old Poppler installation with a drastic command that affected all softwares depending on Poppler (that’s why you might not want to reproduce this at home) like GIMP or Libre Office Writer: sudo apt-get remove libpoppler*. But, after I did that, I was able to install pdftools using the newest Poppler version. Because of that, I decided to extract the dates of pages that had one, then assign to each undated page the latest available date, before splitting the PDF low level text data into dates and working on a pipeline by date. In a first step, I wrote a pipeline adding the page number to each data.frame from pdftools::pdf_data(). Finally, I created a gigantic data.frame of all the data.frame’s from pdftools::pdf_text(), sorted it by page just to be sure it was sorted by page, assigned to each row the latest non missing page, and then split the data by date which was a better unit to work from. In order to not mess up coordinates, within each date I added 700, 1400, etc. to y-coordinates from the second, third, etc. page. At that point I took a minute to compare the dates I had with the ones in Axios’ clean data. Wat?! I had a look at the PDF, and actually, these dates are not even in the PDF I’m fighting, so no need for me to try and revise my R script. This part was the most crucial, and difficult one. I wanted to obtain a table with one line by event. My strategy was to first extract times by filtering text data whose x-coordinate was in an interval I had decided on by looking at some pages, clean these times to obtain time, duration and y-coordinate of the top of the time info, and then assign words from the right of the page to each event thanks to fuzzy joins: words correspond to an event if their y-coordinate is between the y-coordinate of the time of that event and the y-coordinate of next event. I simply removed all times that where in parentheses, assumed a time with no timezone information had the same timezone as the last event with a timezone, and that the first event of the day, if lacking a timezone, was in EST. In real life if I were really working on such data I’d probably still make such a general assumption but then review the result page by page, preferably with several pairs of eyes. At that point I was fairly happy but I knew that a code review would have been great in real life, and that in any case I needed more work. I wanted to have a duration in minutes for each event as well as a start and end as times, and I wanted each event’s info to be in a single row. Before binding the events with text and no text I had checked by had that no events got lost (using dplyr::n_groups()). Further work aimed at extracting “Location”, “Note”, etc. into specific columns. This code is especially ugly. At this point, again, in a real work environment I’d spend time checking data carefuly, but instead, I’ll just have a rough look at the clean data vs my own cleaned data. I surprisingly have more events in my data than in Axios’ clean data, which would require further exploration. Part of that might be due to my data listing “RON” as events, where RON means “Remainder of the Night” which is not an event, but a way to indicate where the President spent the rest of his time on that day. On one day, the whole schedule is actually “RON”. 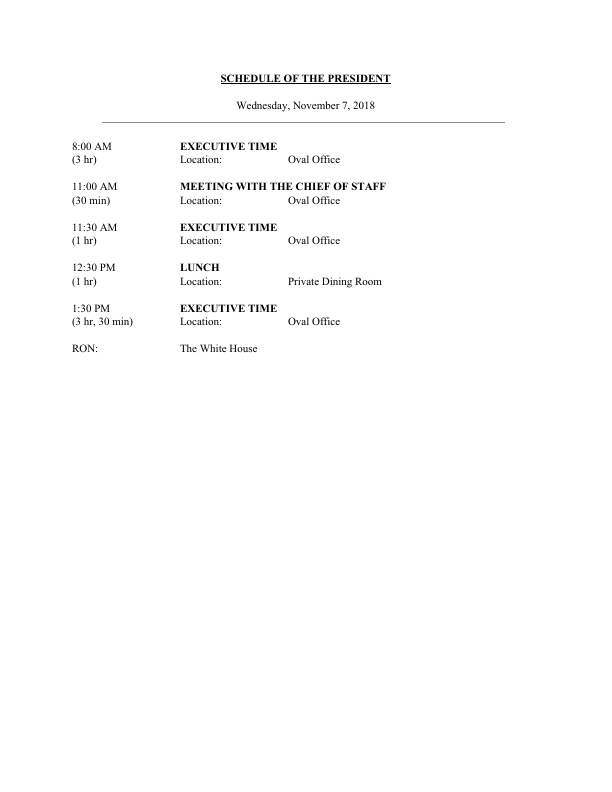 For some reasons, in its clean data Axios classified that day as executive time, although the PDF does not indicate anything about it. I stopped there, not willing to further work on the data. More work on timezones, and on filling missing durations based on context, would be useful. I’d be delighted to see someone cleaning the dataset more thoroughly than I did here! 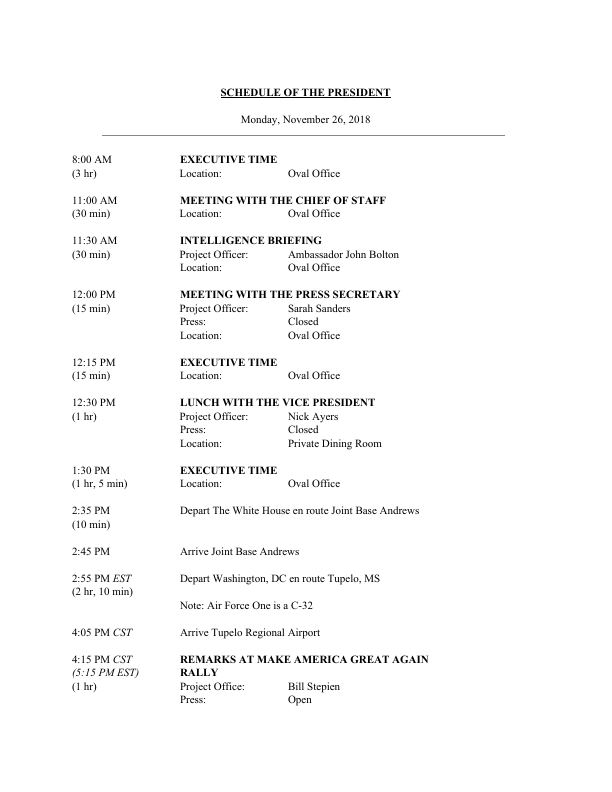 In this post I took advantage of the nifty pdftools::pdf_data() function to extract text from Trump’s PDF schedule along with coordinates, in the hope to be able to rectangle the data. Part of that went well in particular thanks to fuzzyjoin and Tidyverse tooling, part of that went less well, in particular due to the inexact data formatting and less than optimal indication of timezones… and my not desiring to spend my week cleaning the data. I have no idea how Axios prepared the dataset, but if I were to clean such data for actual work, after scripting as much as possible I’d request at least one colleague to review the code, and this person and I would also sample a few if not all events and compare their information in the PDF and the resulting data. The advantage of scripting at least part of the cleaning is reproducibility, for being able to explain what happened to the data, but also to apply the code to new data. This morning I read that more schedules had been leaked so I tried my code on it. I think that the fact that my (imperfect!) pipeline seems to work on the new schedules shows the power of scripting one’s data cleaning… as well as the hard work Axios’ journalists did! If you work on the PDF data, I’d be glad to hear how you handled it, so share links to gists and posts in the comments below! If you prefer playing with the data, check out this cool Shiny app by Garrick Aden-Buie.